We’re happy to announce our plans for in terra pax 2019. This year’s rehearsal week will take place between June 8 and June 17 in Międzyzdroje. Like last year Szymon Wyrzykowski from the Academic Choir at the West Pomeranian University of Technology, Szczecin, Poland (CHAPS) will be our artistic director. Christiane Büttig, who is leading the University Choir at the Technical University of Dresden, will come back as German conductor. More information about this year’s in terra pax can be found in planning. You are already convinced and want to participate? Then please get in touch with us. We’re happy to announce our plans for in terra pax 2018. This year’s rehearsal week will take place between June 17 and June 24 in Międzyzdroje. As last year Szymon Wyrzykowski from the Academic Choir at the West Pomeranian University of Technology, Szczecin, Poland (CHAPS) will be our artistic director. Christiane Büttig, who is leading the University Choir at the Technical University of Dresden, will come back as German conductor. We have been to Dresden to prepare for our concert and attract visitors and we are very much looking forward to our little concert tour. We’re happy to announce our plans for in terra pax 2017. This year’s rehearsal week will take place between June 18 and June 25 in Międzyzdroje. As last year Szymon Wyrzykowski from the Academic Choir at the West Pomeranian University of Technology, Szczecin, Poland (CHAPS) will be our artistic director. We are happy to welcome Christiane Büttig, who is leading the University Choir at the Technical University of Dresden, as German conductor. 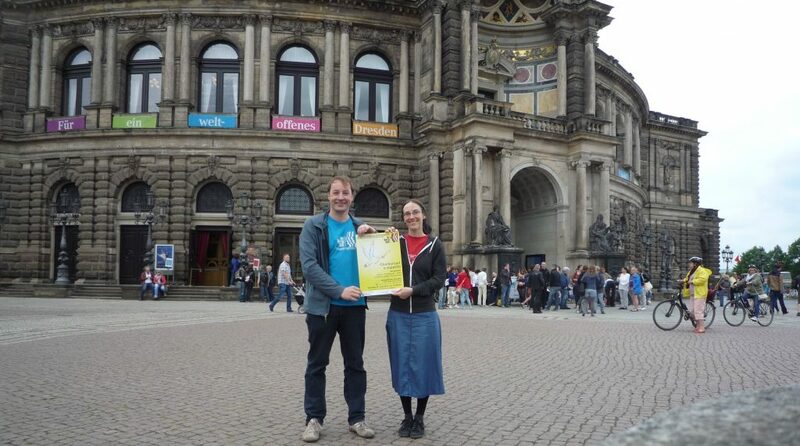 Our final concert will be on June 25th in the Annenkirche in Dresden. Merry christmas and a happy new year to all members and friends of in terra pax. We hope you are enjoying this time with your families. The schedule for 2016 is not final yet, but we do have some dates for you, so that you can save this week in your calendar! The rehearsal week in Miedzyzdroje will start on Friday 17th or Saturday 18th of June and we will have one week together as usual. Directly afterwards we want to go on a concert tour, details will follow. All we can say for sure is that it will not last longer than until Friday July 1st. This is the 25th edition of in terra pax and the first time we go on tour through Poland. We are very excited about this! Here is a small outline of the rehearsal week and the planned concerts. 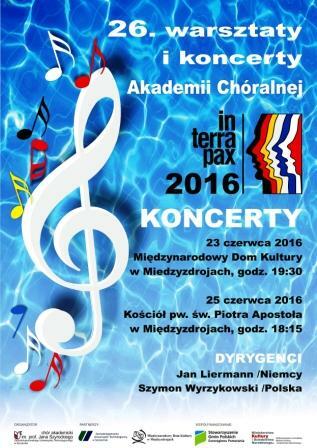 Wednesday June 24th – Concert in culture hall, Międzyzdroje (during the 50th international choir festival). Friday June 26th – Concert in culture hall, Międzyzdroje. Sunday June 28th 20:00h – Concert in Our Lady of the Rosary church, Wrocław. Wednesday July 1st 19:30h – Concert in St. Joseph church, Kraków. Thursday July 2nd 18:00h – Concert in culture hall, Rzeszów. Merry christmas and a happy new year to all members and friends of in terra pax. 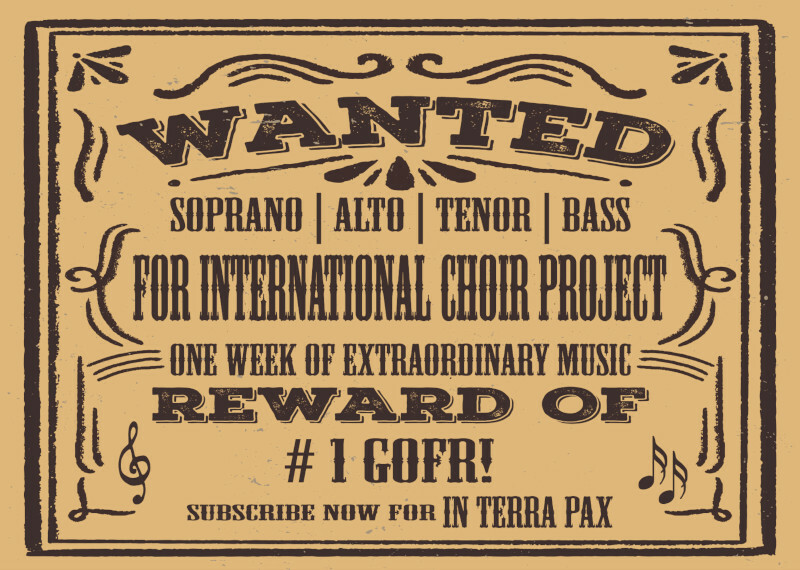 Next year there will be two big anniversaries, the choir festival is taking place for the 50th time and it’s the 25th edition of in terra pax. Therefore everything will be a little bit different. The working week in Miedzyzdroje will likely start Friday June 19th and end on Saturday June 27th 2015. The festival is already scheduled for the weekend of June 20th-21st, that’s why our start date will also be earlier and afterwards there will be other special concerts in Miedzyzdroje. Right after we’d like to organize a concert tour in Poland. The idea is to take the bus from Stettin to Krakow and have concerts in different cities. If everything works out the tour will end with a final concert in Krakow on July 3rd 2015. Whether the trip can take place and further details will be announced next year.